How Does a Hair Surgeon Create a Natural Hairline Design? Many of us are born without any hair on our heads. If we do have some, it’s usually fine and wispy and may even fall out before growing back again. Some of us are born with full heads of hair, that are remarked upon in family photographs for decades to come! Either way, when our hair does start to grow, and our parents start to picture what colour, texture and style our hair might develop into, one thing is certain – we (nor our parents) needn’t think about what our hairline is doing. The overall style might be wild and curly, or it might even stand up on end, but the line of our hair around the forehead, sides of the scalp and the back of our neck tends to be quite uniform. Just like our fingers and toes are generally in the right place, our hair is too. The front of our hair doesn’t start growing from our eyebrows for example. Or extend down over our ears or down our backs. Then, throughout childhood, we tend not to think about our hair much. Often, it’s just something that gets in the way when we’re riding our bikes or concentrating on our colouring books. Then through adolescence and into adulthood we might start to think about how it makes us look. How we style our hair, or colour it or wear it, might define us. It might be our statement to the world about who we are. We might even have ‘hair envy’ when we look at our friend’s, or celebrity’s hair. We might wish our hair was straighter, thicker, curlier, longer or a totally different colour or texture. This receding hairline might bother us so much, that we start to think about having a hair transplant and begin to look up hair surgeons and hair restoration clinics. And then we think wow! What if I had a whole new hairline? Not just a thicker head of hair, a whole new hairline! Will it be even better than the one I was naturally born with? Then, oh goodness, what if its worse? What if my hair surgeon does it wrong, and my hairline looks totally weird and unnatural? And this is quite aside from all the usual questions; will it hurt, how much will it cost, how long will I have to wait until I notice a difference. And so on. Well it turns out, the best, most qualified and most experienced hair surgeons take our hairlines very seriously. 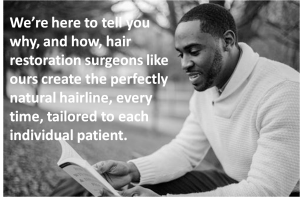 And today we’re here to tell you why, and how, hair restoration surgeons like ours create the perfectly natural hairline, every time, tailored to each individual patient. Because your hair is as individual as you are. There’s no point giving you, my hairline. Or someone else the hairline of anyone else, is there? First off, lets make clear what the ‘hairline’ is, just in case there’s any confusion. It’s the space on the scalp, where your hair meets your forehead. There’s no hard and fast rules, but generally it’ll be a few centimetres above your eyebrows. It’s also the most noticeable area of your hair. You see it the most when you look in the mirror, and others see it the most when they look at you. The only exception is your hairdresser, who spends most of their time looking at you from behind. And aside from being a technically perfect hair restoration expert, designing a natural hairline is the most important aspect of transforming someone’s life with a hair transplant. It takes skill and expertise, as its far more than just drawing a line across someone’s forehead and filling in the gaps between this line and line of hair loss. So first up – no straight lines. Whether you want to keep the fact you’ve had a hair transplant a secret, or you want to shout it from the rooftops, you’ll want your hairline to look natural. That is, a naturally occurring almost ‘uneven’ line around the front of your scalp. What you don’t want is an unnatural straight line shaped in an arc around your forehead. No one, apart from dolls, has such a straight hairline. We all have tiny, almost undetectable ups and downs where our hair naturally starts growing from. Next up, no one has hair that starts off as thick as it naturally is around the top and back of the head. So no hair surgeon worth their salt, is going to start by transplanting thick hairs to the very beginning edge of the hairline. At the DK Hair Klinik, we only use the FUE, or Follicular Unit Extraction, method of hair transplantation. This is considered the gold standard technique and is far superior to the older, FUT, or Follicular Unit Transfer method. FUE involves the surgeon removing small units of tissue that contains up to three or four hair follicles and up to 20 hairs using a special punch tool from the donor area (usually the back and sides of the head). Then the surgeon will transplant them directly back into the scalp in the recipient area (usually the front and top of the head). Our expert surgeons work out what hair will grow best where. This means using the thickest donor hairs for further back from the hairline, and the finer hairs for around the very front of the hairline. This mimicking of a natural hairline helps ensure the new hairline does its job – connecting the beginning of the hair with the ending of the forehead – without being obvious. The idea is for the hairline to be there, but not obviously. This is known as the ‘feathering zone’ and the technique involves adding follicles in a ‘micro-irregular’ pattern. Usually, hair follicles containing single hairs are used around the immediate hairline. Then hair follicles with two hairs in the rows behind and then gradually getting thicker with triple and quadruple hairs thereafter. The direction of hair growth will also be taken into account. You don’t want hair growing in the wrong direction, or in opposite directions around the length of your hairline. 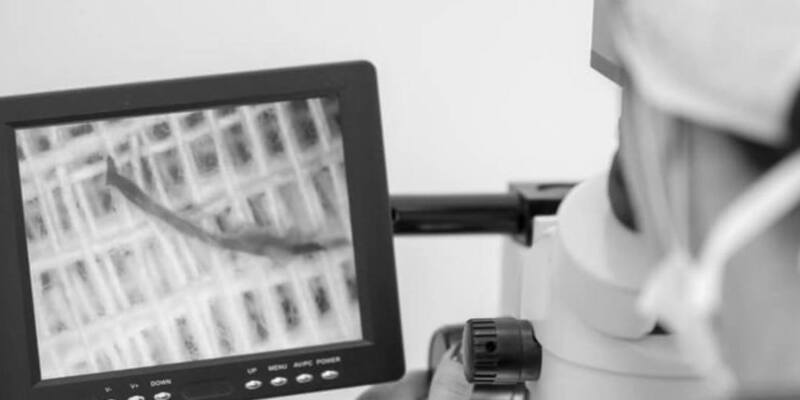 So your surgeon will take care when designing your new hairline to transplant follicular units at the right angle, direction, depth and frequency to ensure a seamless look. The natural thickness, of your hair will be mimicked as closely as possible. Also, your surgeon will consider your face shape and facial features, but more in that shortly. Plus how your hair used to be will be thought about. Your age will also be taken into account. As a man ages, it’s natural for the hairline to move backwards a bit. So your surgeon will take this into account. It wouldn’t be natural for a man in his 40s to have the hairline of a man in his 20s, so a good surgeon will keep this in mind. This might come as a shock to you, after all, you want to recreate your youth, right? Well yes, but not at the expense of your hairline looking odd. Because your skin and facial features will give everything away, even if you’ve had other cosmetic surgery! You want your face and hair to match up, and that’s crucial. That’s not to say your new hairline will begin too far up your scalp, that would be silly, and it would be pointless having a hair transplant. It’s just all about subtlety. And besides, your new hairline will be designed and drawn on for you to see and give the go ahead to, both at your consultation and again when you come in on the day of your surgery. Finally, your surgeon will also consider the amount of donor hair you have available, and what your future hair loss situation is likely to be. A surgeon isn’t going to design a hairline that risks taking too much donor hair or is likely to be too big a space to fill with the amount of donor hair that can be safely taken. Nor will your hair surgeon leave you at risk of a patch of thinning hair between your new hairline and where you’re naturally balding. Let me explain. Unless you’re simply filling in the front of your hair because you’d like it to be thicker and you’re not really balding, or you intend on taking hair loss medication for the rest of your life, your male pattern baldness could well continue. Where it stops now, might not be where it stops in a few years’ time. Therefore, you might need to have subsequent hair restoration procedures. This isn’t the case for everyone, but it is quite normal. If your hair loss is likely to get considerably worse, your hair surgeon will take care not to use all of your donor reserves in case you need them again. Some surgeons will advise that you wait until your hair loss has stabilised or will suggest you take medications such as Propecia to stop your hair loss getting worse before having a hair transplant. Many surgeons will resort to techniques thought to originate from Michelangelo to design the perfect hairline, presumably skills he learnt when painting human faces! The idea is that a surgeon will divide the face into three equal parts. The exact middle part of the hairline, the midline, is a few centimetres from the glabella, the part of the forehead above and between the eyebrows. Then the surgeon will imagine a curved line sweeping from the midline around each side of the head to the temple area. In this area, the hairline on each side is usually determined using measurements from the outer corner of each eye. It sounds complex, but in the hands (and eyes) of a good surgeon, you have nothing to worry about. The results of a study reported in the Surgical and Radiologic Anatomy journal in June 2017 are widely used by surgeons when designing natural hairlines. The study was carried out at Ege University in Izmir, Turkey. They looked at the face shapes of 200 young Turkish adults and determined five different shaped hairline contours – round, M shaped, rectangular, bell shaped and triangular. Male hairlines tend to be more rectangular or M shaped, and female hairlines tend to be rounder. Each person had measurements of the height and width of their foreheads taken and all of this information is now used in determining natural hairline designs prior to hair restoration procedures. This might not be of any use to those of us who aren’t hair surgeons, but it goes go to show how much time and effort is put into getting the hairline right. As with all areas of medicine, hair transplants techniques are ever evolving. We’ve come a long way since the ‘dolls hair plug’ procedures of years gone by and hair transplants can and do look entirely natural. If you’d like to see what kind of new hairline we could achieve for you, then signing up for our free online consultation is the first step. We hope to see you in the clinic soon!